If you’re sore after a workout, are you injured? Strangely, it depends whom you ask. The National Strength and Conditioning Association’s (NSCA) Tactical Strength and Conditioning (TSAC) program says soreness is an injury. CrossFit, NSCA board members, and others disagree with the NSCA TSAC program, stating that soreness is a normal part of training. According to the NSCA, Katrin and every other Regional athlete is injured. The topic of Dr. Sell’s article is “Decreasing Injury Risk During Physical Training.” Dr. Sell’s article is par for the NSCA course. It contains the normal veiled attacks on CrossFit and sponsor-approved hydration handwringing. But what sticks out is Dr. Sell’s soreness = injury assumption. If soreness is indeed an “injury,” should trainers try to minimize the rate of soreness? Dr. Sell is a member of the NSCA Tactical Strength and Conditioning Special Interest Group (SIG) Executive Council. As such Dr. Sell represents and determines the views of the NSCA TSAC program. Injury incidences from ECPs are unknown beyond isolated case reports of exertional rhabdomyolysis (ERM) and delayed onset muscle soreness (DOMS) (3,19). Like Sell, Leahy classifies cases of soreness as “injury incidents.” This assumption permits Leahy to classify everyone who became sore after training at a CrossFit affiliate as injured. Yet soreness is not unique to CrossFit. Bodybuilders, powerlifters, strongmen, endurance athletes, and other athletes often report muscular soreness. Are they all injured? Once you step outside NSCA’s TSAC program, fitness authors take a more realistic approach to soreness. You need not go far. As Lon Kilgore’s “You Be the Judge” series has exposed, the NSCA’s alleged authority figures are inconsistent on many topics. Soreness is no exception. In their abstract Schoenfeld and Contreras note that “Delayed Onset Muscle Soreness is a common side effect of physical activity.” If they consider this “common side effect” an injury, they don’t say so. … common strategies to minimize DOMS, such as increasing training frequency, adhering to the same exercise selection, performing concentric-only exercises, and performing solely exercises that stress short muscle lengths, can help maintain short-term athletic performance, they may ultimately compromise hypertrophic adaptations by blunting EIMD (Exercise Induced Muscle Damage. high levels of soreness should be regarded as detrimental because it is a sign that the lifter has exceeded the capacity for the muscle to efficiently repair itself. Moreover, excessive soreness can impede the ability to train optimally and decrease motivation to train. muscle damage and soreness are essential and probably unavoidable pre-requisites for optimal muscular adaptation. If you have an aversion to feeling sore, you can either stop doing CrossFit (not an option for most!) or reframe your attitude. The initial phase is the alarm phase (sometimes referred to as the shock phase) and consists of both shock and soreness. Performance during this phase will decrease. This would be synonymous to the initial effects a workout has on the athlete. The second phase is physiological adaptation to this new stimulus. The body adapts to the new training stimulus and an improvement in performance ensues. Once the body has adapted, no further adaptations will take place unless the stimulus is altered. Soreness precedes adaptation, in the ACSM’s description. If soreness is widely accepted as a standard component of safe and effective training, why does NSCA’s TSAC program strangely classify soreness as an injury? This position is inconsistent with what NSCA officials have said. If taken seriously, the “soreness equals injury” assumption would make the injury rate in CrossFit and any other effective fitness program nearly 100%. Perhaps that’s the point. Remember Gatorade’s Michael Bergeron and the CHAMP editorial he and his colleagues penned? So the ACSM/Gatorade/CHAMP/NSCA tried publishing unsubstantiated concerns about CrossFit’s injury risk. 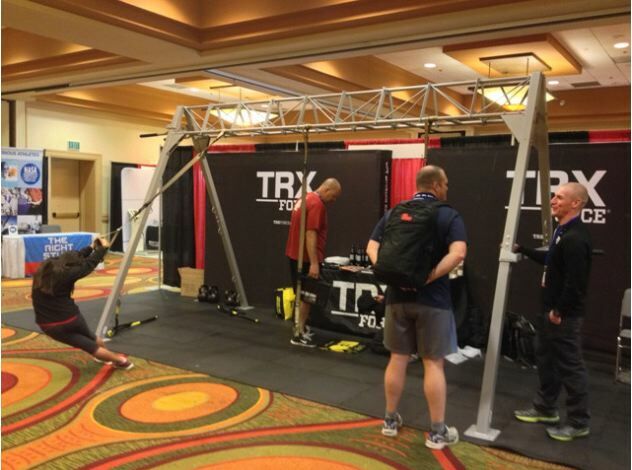 This scheme didn’t work – the US military remained CrossFit’s single largest client. CHAMP published its editorial in 2011. Four years later, we have a body of published studies regarding CrossFit: Hak, Giordano and Wiesenthal, the Army Brigade study, Henrich, etc. What have they found? No published evidence supports the ACSM/NSCA conjecture that CrossFit causes an elevated rate of injury. All available evidence contradicts ACSM and NSCA’s CrossFit conjecture. 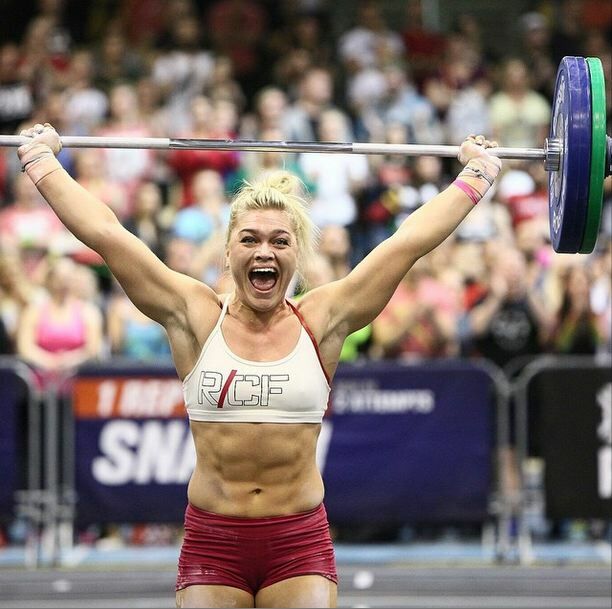 In 2013 the NSCA knowingly published fabricated injury data about CrossFit. That didn’t work, either. CrossFit uncovered the fraud. The subjects the NSCA study claimed injured have all sworn to the court that they were not injured in the course of the study, and never told the researchers they were. are not required to possess the advanced training available from universities or esteemed organizations such as the NSCA or ACSM. To maintain the appearance of science, NSCA is trying create some evidence of an elevated injury rate in CrossFit. Now NSCA officials claim soreness is an injury. This assumption allows the NSCA to document abundant cases of “injuries” in CrossFit affiliates. Unfortunately, classifying soreness as an injury contradicts the NSCA’s own material, and common sense. 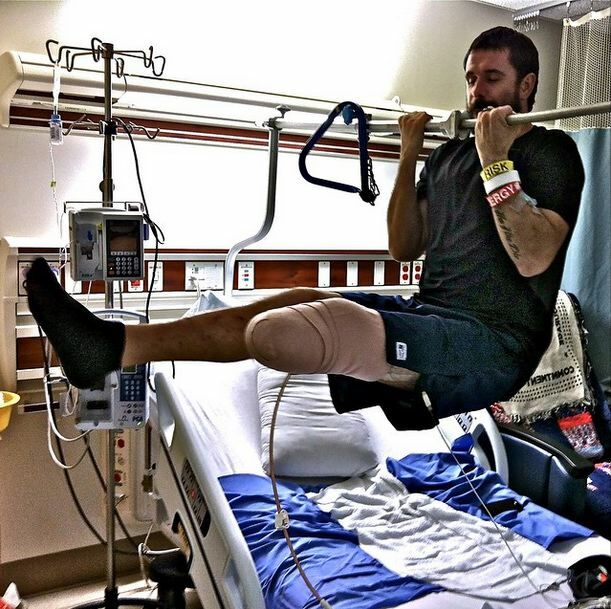 This is a real injury, but US Marine Chris Bannister didn’t let it stop him from doing 50 L pull-ups for time. I’m assuming you guys read Katie Sell’s article more than once. Just out of curiosity, how is it a “veiled attack on CrossFit”? Direct quotations as examples would be nice. As an actual, real-life tactical strength and conditioning professional who deals with special operators on a daily basis, I see this article as well-written, unbiased, and exactly on point. The topic of this article is the question: Is soreness an injury? Do you think that soreness, by itself, constitutes an incident of injury? Yes or no? Citing an evidence-less hit piece on CrossFit while criticizing “competitive” and “universal” programming – it’s clear what Dr. Sell is trying to do. As for hydration, she emphasizes “optimal hydration” and warns of the “risk of dehydration.” She does not mention the far greater risk of hyperhydration, nor define what optimal hydration is. In other words, her hydration stance is biased towards encouraging consumption and against the prevention of hyponatremia. Hence it is sponsor-friendly. An accurate, sponsor-unfriendly hydration message would have encouraged athletes to just drink to thirst, warned of the risks of hyper-hydration, and perhaps mentioned that there’s no evidence that dehydration causes heat illnesses. So are you saying that, as a strength and conditioning professional, I should NOT consider “additional variables including recovery time…resistance to fatigue…fitness levels…” when making my decisions on when to “engage in a given training approach”? If that’s the case, and if I should NOT consider those variables, what should I use to dictate my training approach? Additionally, are you saying that I should NOT consider the “physical capabilities” of each one of my operators before deciding whether or not I want to introduce “a competitive…environment”? I agree that the CHAMP article leaves many things to question, but I don’t need an article to tell me, as someone who does this for a living, that individualized programming is better than “universal” programming and that adding competitive aspects to training can, when done incorrectly, greatly increase the risk. SURELY you agree with me there. No, I didn’t say any of those things. Are you saying that soreness is ipso facto an injury? Not at all. In fact, as you state in your article, soreness is often a good indicator of quality training. HOWEVER, what you don’t mention is that soreness can ALSO be an indicator of injury. In that sense, I would argue that soreness exists on a spectrum. Soreness is by no means black and white, which you don’t acknowledge in this article. Delayed Onset Muscle Soreness (DOMS) also goes by the name “muscle fever.” If you think of it in terms of health/wellness, one could consider slight soreness post-CrossFit to be a “muscle head cold” while something more severe, i.e. DOMS, to be “muscle fever.” Surely you’ll agree a fever is worse than a head cold? DOMS is an INDICATOR of muscle damage induced by exercise. As someone who deals with tactical athletes, I use scales such as RPE, Soreness, etc. to dictate my programming. If a guy is excessively sore in, say, his hamstrings, I’m not going to program heavy deadlifts. When guys hurt/are sore in certain positions, they will avoid those positions. Often times, avoidance of proper positioning leads to a defaulting to improper positioning leading to improper movement patterns leading to injury. See the progression? What I think you guys should do is instead differentiate between DOMS and Acute Muscle Soreness, or at least acknowledge that while YES, muscle soreness (in black and white terms) is not in and of itself an injury in the traditional sense, it is certainly a warning sign. Then we agree. You’ve gone through a lot of trouble to paraphrase the same points I made in my article. No mild or moderate soreness is not an injury. Yes extreme soreness and/or soreness accompanied by swelling and discoloured urine may indicate injury. My main issue is with counting instances of soreness as “injury incidents” against CrossFit, as Guy Leahy did. Unfortunately exercise physiology doesn’t have a solid definition of injury yet, so the NSCA can get away with counting mere soreness as injury incidents. Delayed Onset Muscle Soreness is due to muscle damage, i.e. small tears in the muscle. The dictionary definition of injury is “act of damage.” In a literal sense, muscle soreness IS an injury. Now just because it is technically an injury, does not mean it is a problem. The fact that the small tears that occur while strength training leading to DOMS will produce greater hypotrophy is not discussed in Katie Sell’s article. Now, if her paper was claiming that muscle soreness (ie muscle injury) from CrossFit is somehow more detrimental than any other training, the rest of this article, and attack on her paper, might make sense. However, she does not. She does not define “injury”, however this statement “..the likelihood of injury, which may also lead to financial ramifications related to absenteeism and worker’s compensation costs” implies that an injury is problematic with it increases absenteeism or worker’s comp. I think we could all agree a firefighter who is excessively sore to the point that it impacts their on the job performance is a big deal. In this context, excessive DOMS is a problem and training design should take minimizing soreness into account. Another thing, she references the claim that DOMS is an injury. The reference is from a study in the American Medical Journal of Sports Medicine. This journal is affiliated with the American Orthopedic Society for Sports Medicine, not the NCSA. The microtear theory is one possible cause of DOMS, but there are other plausible theories. Sell and Leahy (whom you strangely ignore) are using concerns about injuries to justify the need for ACSM- and NSCA-certified coaches. Leahy specifically uses the cases of soreness as examples of CrossFit injuries, which he uses to make his larger argument against the safety and efficacy of CrossFit. The NSCA’s decision to classify soreness as an injury when it comes to competing with CrossFit, but not elsewhere, is mainly what concerns us here.